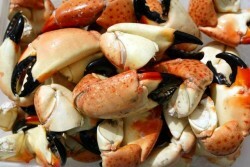 The Florida stone crab is usually fished near jetties, oyster reefs or other rocky areas, just as for blue crabs. The bodies of these crabs are relatively small and so are rarely eaten, but the claws (chelae), which are large and strong enough to break an oyster’s shell, are considered a delicacy. Harvesting is accomplished by removing one or both claws from the live animal and returning it to the ocean where it can regrow the lost limb(s).